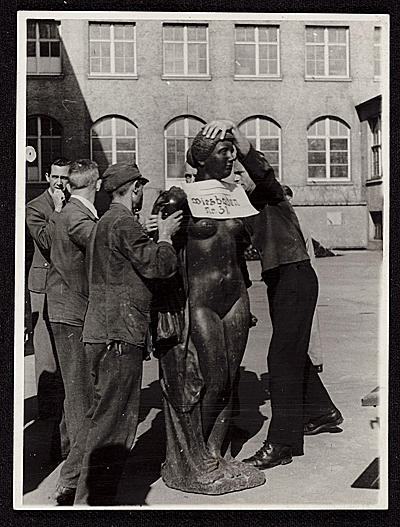 Six men prepare an Aristide Maillol sculpture looted during World War II for transport to France. Sculpture is labeled with sign: Wiesbaden, no. 31. Verso, handwritten: Restitution shipment to France. May 24, 1946. Unidentified photographer. James J. Rorimer papers, Archives of American Art, Smithsonian Institution. The Archives of American Art has been awarded $100,000 by the Samuel H. Kress Foundation’s Digital Resources grant program to support a project to preserve, arrange and create Web-searchable online electronic finding aids for eleven archival collections that are central to provenance research for the history of art during World War II. The Archives created detailed online finding aids for the historical records of Schaeffer Galleries and World House Galleries, as well as the personal archives of museum professionals, art historians and World War II Monuments Men S. Lane Faison, Walter Horn, Thomas Carr Howe, J.B. Neumann, Perry Townsend Rathbone, James J. Rorimer, George Leslie Stout and Otto Wittmann, substantially enhancing the amount of information that is currently available to researchers about the contents of these collections. Selected highlights from each of these collections will be digitized and made available online. In addition, the papers of New York City art dealer Victor Spark have been digitized in their entirety and made available on the Archives’ website. This body of resources provides additional contextual online access via a dedicated webpage. These newly available World War II-era art provenance research resources are now easily accessible to millions of worldwide users who consult the Archives of American Art’s website. The webpage provides brief summary descriptions of each of the individual collections processed during the project with links to their respective online finding aids, as well as links to relevant oral history interviews and related collections at the Archives, such as the records of Perls Galleries and Jacques Seligmann & Co. The Archives worked with a renowned provenance scholar to write content for the webpage and provide scholarly insight to relevant collections among the Archives holdings that have proven to be critical for provenance research for US and international scholars. This project also complements the Smithsonian Institution’s on-going Provenance Research Initiative and website which also offers many new on-line resources, including a comprehensive workbook, “Guidelines and Procedures for World War II Provenance Issues.” This project builds on the tremendous international exchange and successful outcomes engendered by the “New Era of Collaboration and Digitized Resources: World War II Provenance Research Seminar,” held in Washington, D.C. in May 2011, which was collaboratively organized by several national repositories and organizations with generous support by the Samuel H. Kress Foundation. The seminar presented new resources and strategies for provenance research, emphasized current international collaborative projects and introduced newly accessible electronic tools. A complementary exhibition Monuments Men: On the Frontline to Save Europe’s Art, 1942-1946, was on view in the Lawrence A. Fleischman Gallery, Washington, DC, February 7 to April 20, 2014. Berchtesgaden-25 July 1945. Do you see photo of [unintelligible] on table? Bruges Madonna & child are mounted on one mat and hanging on the wall. Many of the collections targeted for this project are the personal papers of World War II “Monuments Men.” During and after World War II, an unlikely Allied small team of heroes of American and British art curators, scholars, architects, librarians, and archivists were charged with identifying and protecting European cultural and historical sites, monuments, and buildings from bombing. This U.S. Army unit was officially named the Monuments, Fine Art and Archives Section (MFAA), but quickly became known simply as The Monuments Men. As the extent of the Nazis’ systematic looting of the cultural and artistic heritage of Europe became more apparent towards the end of the war, this unit became responsible for locating and recovering the hidden caches of fine and decorative arts, national treasures, and other cultural properties stolen by the Third Reich. Although they often served on the front lines and two members of the unit were killed in action, the Monuments Men were neither typical soldiers nor military career men. These were well-educated men who went on to highly influential positions in the art world. Here at the Smithsonian, we most often recognize the names of these men for their later curatorial and scholarly work in some of the most notable art museums in the country. But, we rarely recognize them as World War II heroes who saved the cultural and artistic heritage of Europe. The archival resources at the Archives of American Art relating to the American Monuments Men and the Allied Restitution Authorities during and after World War II are a unique group of holdings that detail the activities of an extraordinary group of art historians engaged in the identification and restitution of displaced and looted art. If considered in the context of each other, these papers have the potential to engender new understanding and insight into the role of American art historians in the art world of the war and its aftermath. These papers provide researchers with a personal perspective that is often lacking in the official government record. Nazis during World War II, down a staircase at Neuschwanstein Castle, 1945. James J. Rorimer papers, Archives of American Art, Smithsonian Institution. The Archives of American Art holds the personal archives papers of many of the U. S. Monuments Men and digitized sound recordings of oral history interviews with four of them. Their diaries, letters, manuscripts and writings, extensive photographs, and recorded interviews document their efforts to save Europe’s historical sites, icons, artifacts, and art from total destruction. Some of the Archives’ collections also contain later documents with commentary by the creators about their work in the MFAA as well as manuscripts and typescripts of books they wrote and later published about their World War II work. The MFAA section was small enough that many of the men knew one another professionally and corresponded with each other during and after the war. Monuments Men whose collections are among the holdings of the Archives of American Art include George Leslie Stout, James J. Rorimer, Walker Hancock, Thomas Carr Howe, S. Lane Faison, Walter Horn, and Otto Wittman. The Archives also conducted oral history interviews with George Leslie Stout, S. Lane Faison, Thomas Carr Howe, and Otto Wittman. An interview with Stanton Catlin also covers the topic with a great deal of information about French curator and spy Rose Valland. Thomas Carr Howe’s collection includes manuscript versions of his book Salt Mines and Castles. Drafts and manuscript versions of James J. Rorimer’s book Safe-Keeping are found among his papers at the Archives. Many, but not all, of these collections were targeted for processing during this grant project. This page will be updated as the collections are processed with links to their respective finding aids and digital content.